Lorna Lee is the winner of the Best Local Authority Arts Champion – Officer award in our 2018 Hearts for the Arts Awards. Just two weeks after we announced our winners, we were delighted to hear that thanks to the work of Lorna and her team, her home borough of Waltham Forest has been chosen as the inaugural London Borough of Culture. We caught up with Lorna and asked her how the arts shape and motivate her. Home is… London – originally Lancashire. First job… Conservation Research Scientist at the British Museum. Last play/exhibition you saw… Rhythm and Reaction, Two Temple Place. A time you were moved by the arts: Students from Chingford- speaking to a group including Head Teachers- explaining how their involvement with Arts Award at the William Morris Gallery had built their confidence and help them make friends- very powerful. Early bird or night owl? Both. Who’s your arts hero? Jeanette Winterson. Best thing about the work you do? No two days are the same, and the amazing people I meet and work with. Desert Island luxury? Ice cream. Where do you see yourself in 10 years’ time? Somewhere completely unexpected. 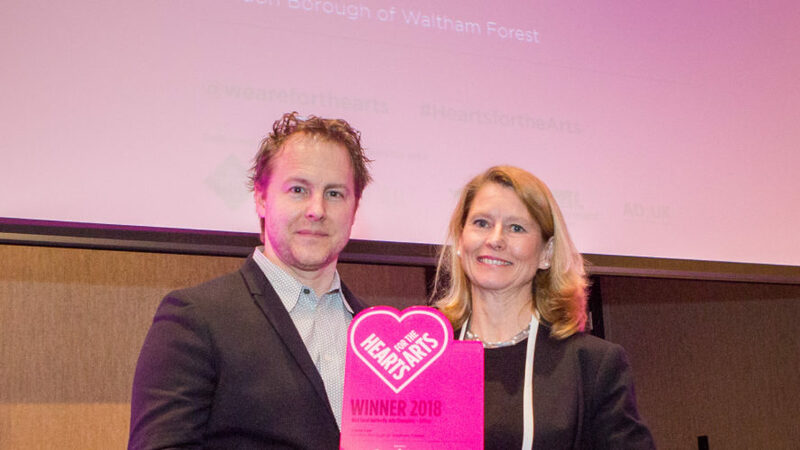 How do you feel to have won a Hearts For The Arts award? Thrilled! Nominations for the 2019 Hearts for the Arts Awards will open later this year. Watch this space. Pictured above: Lorna Lee and Chair of the National Campaign for the Arts, Samuel West.